Ann Elizabeth Isham (January 25, 1862 – April 15, 1912) was a passenger aboard the RMS Titanic. She was one of four female first-class passengers to die when the ship sunk. Her death was probably due in part because she did not want to leave behind her Great Dane; a woman was reportedly sighted in the water with her arms frozen around a dog. Ann Elizabeth "Lizzie" Isham was born on January 25, 1862, in Chicago, Illinois, the first child and eldest daughter of Edward Swift Isham, an American lawyer and politician from Vermont, and Frances "Fannie" Burch. Her father established a law firm with Robert Todd Lincoln, son of former US President Abraham Lincoln, called Isham, Lincoln & Beale in Chicago, Illinois. Initially Isham lived in Chicago and was a member of the Friday Club and the Scribbler's Club. 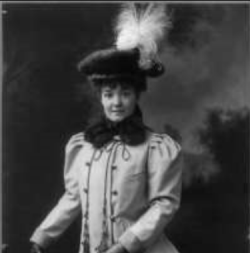 In 1903 she moved to Paris and lived with her sister, Frances Isham, who had married Harry Shelton. Isham's brother, Edward Isham, lived in New York City and Isham was going back to the United States to spend the summer with him. She boarded at Cherbourg on April 10, 1912. Her cabin (C-49) was next to that of Colonel Archibald Gracie, although he did not remember ever seeing her. Isham was said to have been on board a lifeboat ready to sail away when she was told that she was unable to bring her dog, a Great Dane, on board with her. She chose to get off the lifeboat. Isham was one of four first class women who died in the disaster, and her body was never identified. A few days later, a crew member of one of the rescue ships reported seeing a woman's body floating in the ocean and holding on to the body of a large dog. A memorial to her was erected by her family in Vermont.